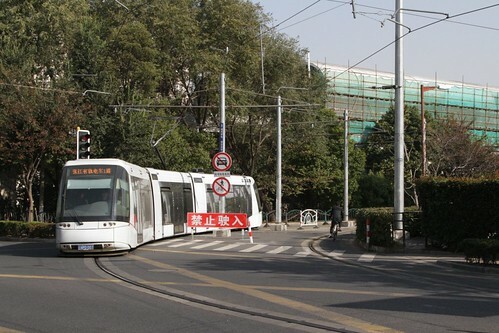 A long way off the beaten tourist track of Shanghai is an unusual mode of transport – the Zhangjiang Tram. It looks a little like a normal light rail system. 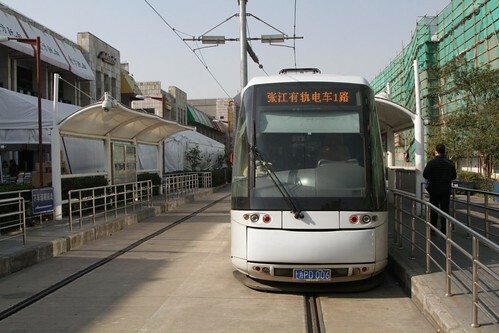 With a track running down the middle of the road, and overhead wires to supply electric power. And platforms for intending passengers. 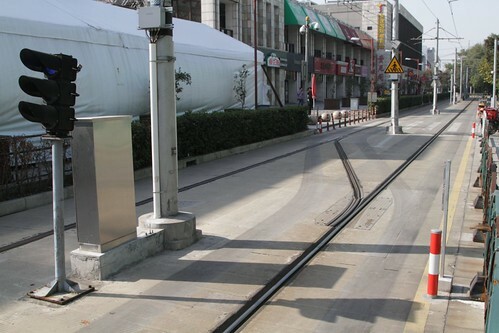 But the vehicles run on rubber tyres, guided by a central rail. So are legally considered motor vehicles, and have registration plates affixed to the front. 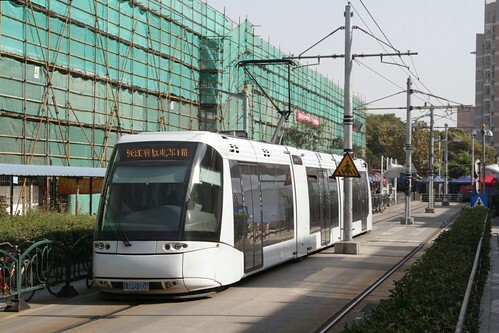 The 10 km (6.2 mi) line runs from Zhangjiang Hi-Tech Park Station on Shanghai Metro Line 2 to Heqing Town, with 15 stops along the way. 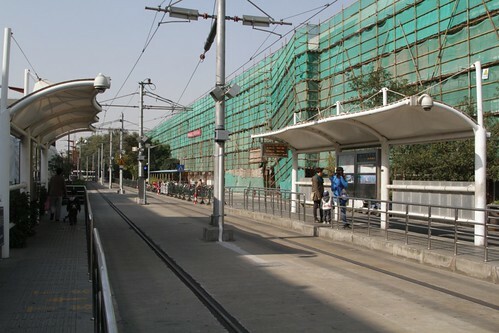 Construction of the Zhangjiang Tram started in December 2007, with the first tram running in December 2009. The Translohr system was originally developed by Lohr Industrie of France. 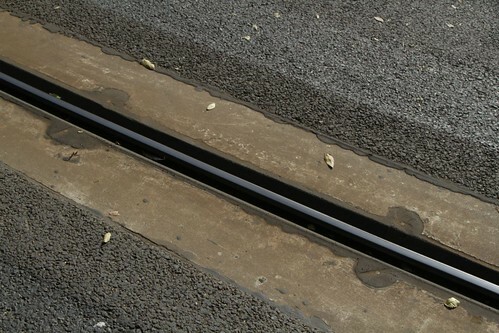 The trackwork for a Translohr system differs to standard tram tracks. The pair of rubber tyres leave scuff marks behind. 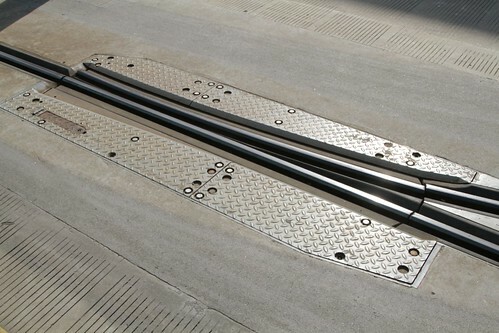 Beneath each vehicle are a pair of guide wheels arranged in a ‘v’ shape. 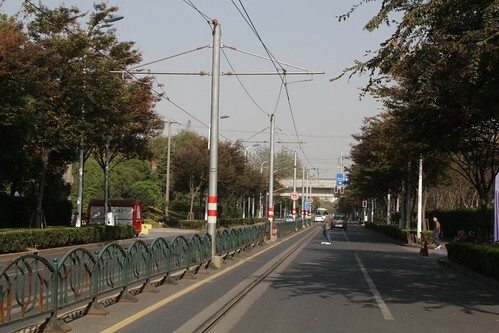 Which engages the central guide rail, which has two running faces. 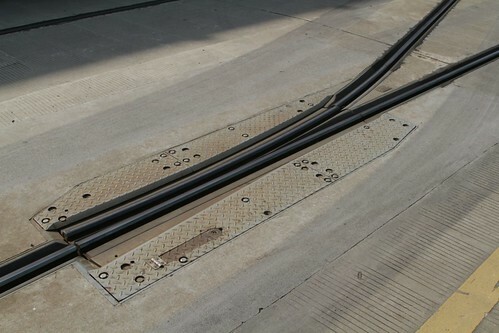 But the pointwork is the most complicated part of the system – the ‘frog’ section made up of two rigid pieces of rail fixed to a solid plate. 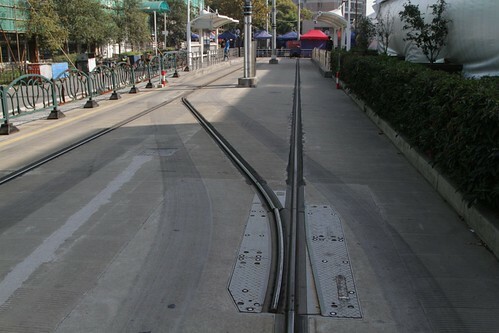 Which rotate in place to direct the guide wheel along the straight or diverge route. 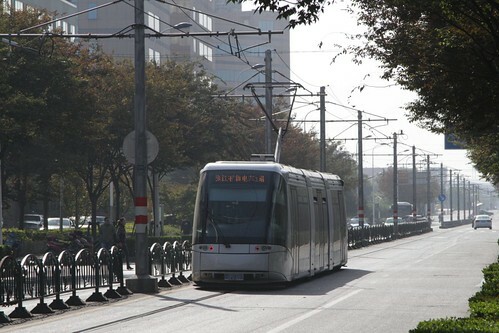 This entry was posted in Transport and tagged China, France, light rail, Shanghai, trams, Translohr. Bookmark the permalink.